Mallorca Airport, also known as the Son Sant Joan Airport and Palma de Mallorca Airport (IATA Code: PMI) is one of Spain’s most popular, thanks to its location near one of the countries most famous beachside vacation destinations. The airport handles approximately 22 million passengers a year, the third-largest in Spain behind Madrid and Barcelona. Plans to expand the airport to service up to 38 million passengers a year is under development, with completion planned for 2015. Mallorca Airport is equipped with two terminals composed of four modules, each equipped with numerous gates and air bridges. 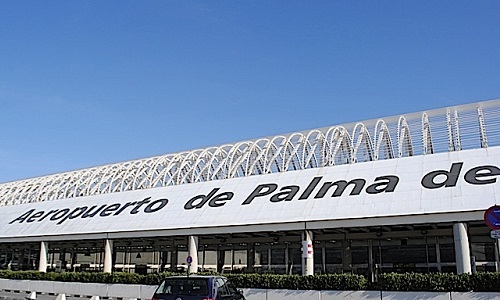 Palma de Mallorca Airport dates back to the 1920s when it was first used by seaplanes to deliver mail to outline islands, and then in the 1930s for domestic flight routes throughout Spain. It wasn’t until 1958 that the airfield transitioned from more military or commercial purposes to a civilian airport. The airport commenced international and domestic flights in the summer of 1960. Since then, the airport has steadily increased the number of travelers it serves, transporting mainly to destinations in Spain, Germany, and the United Kingdom. 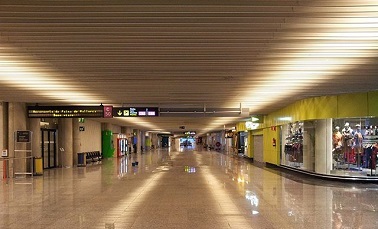 Services provided at Palma de Mallorca Airport are spread between its four floors. Banking services, postal services, and a number of snack bars, coffee shops, and a restaurant are located on the second floor in the arrivals area’s throughout the terminal. Duty-free shops, travel agency, gift shops, and a pizzeria are located inside the terminal. A24-hour cafeteria and bar are also available, as is a tobacconist. For business travelers, VIP lounges and a boardroom are also available, although it is recommended that travelers call ahead to book the board room to ensure it’s available when required. Car rental desks of major car hire companies are located in the arrivals hall terminal on the ground floor next to the main car parking building and within easy walking distance of arrival areas and baggage claim. Compare pricing and services offered by major and local carriers. A few local carriers include Centauro, Auriga Crown Mallorca Airport, and Goldcar Rental Mallorca Airport. It is recommended that travelers book a car hire in advanced during the popular summer months, or at a minimum of 48 hours before arrival to ensure a car is available. Travelers can access additional information about car hire companies available at Mallorca Airport at their website address here: http://www.aena.es. For additional information regarding Mallorca Airport, access their website at www.aena-aeropuertos.es or by calling their customer service number at 902 404 704. The airport is located at E-07611, Palma de Mallorca, Mallorca, Spain.